Free shuttles to and from Art in the Park are available. BSU’s Brady Garage and ParkBOI downtown public parking garages are offering special all-day rates on select days. For the safety of animals and in consideration of our visitors, please leave pets at home. next to the BAM Info Booth, noted on the map. If you have an emergency, please call 911 immediately. Boise Public Works, Republic Services, Boise State University Department of Community and Environmental Health, and BAM have teamed up to help with recycling efforts. Please use the recycling bins located throughout the park and marked for your convenience. Limited handicapped parking is available in the marked lots near the Rose Garden and Zoo Boise. Please use the Capitol Boulevard entrance. Restrooms for handicapped persons are located midway in Julia Davis Park, in the portable restrooms by the Bandshell and also in the Zoo Boise parking lot. get Art in the Park information here! 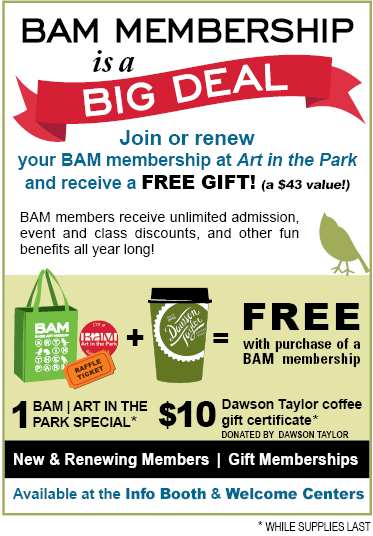 __for free admission to BAM all weekend! Please bring LOST CHILDREN here! 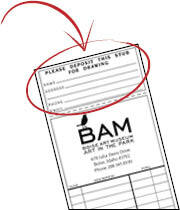 Ask artists for an official Art in the Park receipt with every purchase. Complete the form at the top of your receipt. Drop it into any of the barrels located at the Information Booth and all Welcome Centers. Additional raffle tickets may be purchased at the Information Booth and Welcome Centers. Receiving an official Art in the Park receipt ensures that your purchase supports the Boise Art Museum, a non-profit 501(c)(3) educational and charitable organization. Winners will be notified by Friday, September 14th.